It likewise helps to understand how CSVs (Comma Separated Values) can be used. And you should know how to set up and run local web servers on your computer. Prior knowledge of D3.js and SVG (Scalable Vector Graphics) is not necessary, however. So plan to take your time. 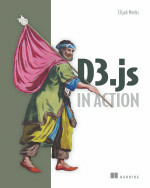 Tackle D3.js in small bites, using the d3js.org website and this text. I am pretty new to learning data visualization, and I definitely had never heard of visualizations such as Voronoi diagrams, nor tools such as TopoJSON, until I started working my way through this book. And those are just a few of the available possibilities. I have not yet tried all of the code examples. But the ones I have tested have worked very well, and they have gotten me thinking about how I can adapt them to use in some of my work. I am a bit disappointed that the book takes 40 pages to get to the requisite “Hello, world” examples. And once you arrive, the explanations likely will seem a bit murky and incomplete to some readers. Well-written and well-illustrated, jQuery UI in Action reflects VanToll’s knowledge and experience as a professional web developer and member of the core jQuery UI team. If you work with jQuery or are ready to start using it, take a good look at jQuery UI, as well. As this book promises, “You’re only one tag away from richer user interfaces….” That tag is pretty simple: <script src=”jquery-ui.js”> — but a lot can happen once you include it. 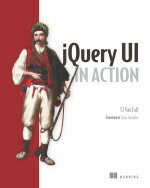 TJ VanToll’s new book should be your go-to guide for getting, learning and putting jQuery UI into action. You’ll master jQuery UI’s five main interactions—draggable, droppable, resizable, selectable, and sortable—and learn UI techniques that work across all devices. Grails finishes at or very near the top in almost any smackdown of full-stack web application frameworks that run on the Java Virtual Machine (JVM). And this recently updated Grails in Action how-to book is mostly a clear winner, too. And, in the portion of the chapter where you are told how to get the random-quote database set up and working, it is not always clear which file you are supposed to modify and in which subdirectory. I already had a little bit of experience with Groovy, so that portion went smoothly. But the Grails database steps could have been explained and illustrated more clearly. It took me several tries to finally get the “Quote of the Day” database working and posting random quotes. Part 1: Introducing Grails – You are shown how to get a nicely formatted Quote of the Day (QOTD) application up and running, while also learning how to work with Groovy. controllers, and views.” Includes such topics as: domain modeling; query mechanisms; how to query a database in Grails without using SQL; Grails’ web-oriented features; Grails Service objects; Grails’ tags for user interface construction; and Grails support for Ajax. Part 3: Everyday Grails – The focus here is on “building all the necessary pieces of a real-world application.” The chapters cover tests, plug-ins, security in Grails and working with RESTful APIs. The chapters also cover (1) Grails single-page web apps using the Angular.js framework, and (2) Spring integration in Grails. Aside from a few small omissions of how-to information, I am happy to have the wide-ranging contents of this book. 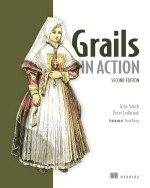 And I am certainly pleased with what I can now do with Grails and Groovy, after reading Grails in Action, Second Edition. I hate writing mixed reviews. It takes enormous effort and thought to create and finish a book. And I have been looking and hoping for a solid how-to text on Ember. For me, however, this book has two key downsides. First, the code examples are written for Ember.js 1.0.0, and as this review is being written, Ember.js 1.5.1 is the latest release (with 1.6 in beta). Second, the book’s opening chapter is very difficult for beginners to follow. Some other reviewers also have noticed problems with the book’s example code –which, for me, forms the heart of a good how-to book. And they have taken issue with how the code is presented in the text. I am fairly new to Ember, so some of the chapters most helpful to me have included using Handlebars js, testing Ember.js applications and creating custom Ember.js components–areas not given much notice in the other Ember books I have read. Hopefully, in the next edition, the all-important opening chapter will be reworked, and the code examples will be presented in a clearer and more complete fashion. Their new book from Manning is nicely written, adequately illustrated and structured properly to help newcomers get started with Play and with basic web application development. Play for Java also can help experienced web app developers quickly get up to speed quickly with this powerful development platform. You start by creating and modifying the ubiquitous “Hello world!” application. Then you spend the remaining chapters developing, expanding and enhancing a warehouse management application, one designed to meet specific requirements within a made-up company. “Enterprise applications usually live inside the IT department and are usually hosted within the organization,” Leroux and de Kaper explain. Indeed, businesses may have several or many enterprise applications serving specific purposes, and those apps often do not communicate with each other. The authors show how to use Play with three IDEs: Eclipse, NetBeans and IntelliJ. Or, if you prefer, you can stick with the Play console and a text editor such as Notepad++ (my current favorite). And they repeatedly emphasize that (1) you should not worry that their Java framework called Play actually is written in Scala and (2) you will encounter some bits of Scala while working with template files. Play supports the optional use of some compiled assets, and “[o]ut of the box, Play 2 comes with support for LESS, CoffeeScript, and Google’s Closure compiler,” the co-authors note. According to Playframework.org, Play is built on Akka and offers “a lightweight, stateless, web-friendly architecture.” It also offers built-in testing tools and speedy “hit refresh” workflow capabilities. Whether you are an experienced web app developer, a newcomer, a student or a hobbyist programmer, it can be serious fun to work with–or play with–Play. And Nicolas Leroux’s and Sietse de Kaper’s Play for Java can be exactly the well-tuned guide you need to learn Play 2.